Micro-gardening is nothing new to Africans, it has always been a way of life growing a traditional home garden of leafy vegetables, tubers and herbs grown in simple containers or small pots. Micro gardening has always been an important source of food for African rural and urban individuals and families. Limited income individuals and families obtain most of their nutrients from food plants, which are cheaper and more accessible than animal foods. Micro gardening often supplements family food supplies during lean periods and can generate added income when other sources of employment and income may be limited. Women and children have historically maintained micro-gardens. Children are often responsible for carrying water and for weeding. 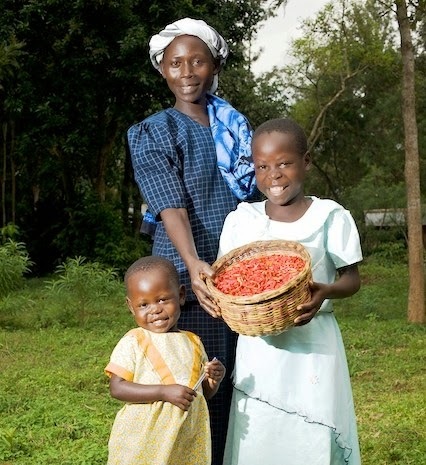 The role of women in micro gardening is of special importance meet their families daily needs for fresh, nutritious produce. In addition to being responsible for producing crops on small plots of land, women, especially those who are elderly, often have good knowledge of indigenous species of green leafy vegetables; they know how to prepare them and how to preserve both seeds and produce. In local markets, the main vendors of these crops are often women. Micro-gardening also raises the importance of reducing water requirements. This is an important consideration in rural areas and developing cities, where good quality water is often scarce and expensive. Depending on the region, the main micro gardening crops in Africa are as follows; Avocados, bananas and plantains, breadfruit, cabbage, cassava, chili peppers, citrus, garden-eggs or eggplants, groundnuts or peanuts, guavas, Irish potato, maize or corn, mangos, muskmelon, okra, onion, papaws, papayas, pumpkins, sweet peppers, sweet potatoes, tomatoes, various beans including soybeans and pigeon peas, various greens including spinach, mustard, soursop and amaranth, and yams.